Aiken & Company is an independent, family-run business offering full-service real estate and property management services. The Real Estate Sales department is managed by Owner and Broker in Charge, Lynn R. Owens, President/CEO. Lynn joined Aiken & Company in 1970, and has since grown the department both organically and by way of acquisitions, he has enabled Aiken & Company Real Estate to be the largest property management firm in Florence, SC including the surrounding counties around the Pee Dee Region. The property management department is managed by 5 associates within the office, who have more than 45 years of combined property management experience. Within Aiken & Company, our responsive team of associates makes sure that unexpected repairs are dealt with quickly. Led by a skilled handyman that is bonded and insured, with more than 20 years of experience in construction and repairs, we are able to offer both tenants and landlords the comfort in knowing that our outstanding crew is able to respond to all maintenance requests efficiently and effectively. Aiken & Company services properties throughout the Florence, and surrounding Pee Dee Regions. We can guarantee superb service unmatched by our competitors. Our proximity to the properties we care for along with our outside sales associates, enables us to visit them frequently and respond quickly and accurately to maintenance requests. With our convenient location in the heart of downtown Florence on the corner of Warley and Cheves Streets, we are easily accessible to our owners and our tenants, allowing personal, face-to-face contact. You will need to go look at the property that you are interested in renting. There is a $25 refundable key deposit to check out the key. When you bring the key back, we give your money back. Keys can be checked out Monday to Friday, 8:30 am to 12:30 pm and from 1:30 pm to 4:00 pm. They must be returned the same day. 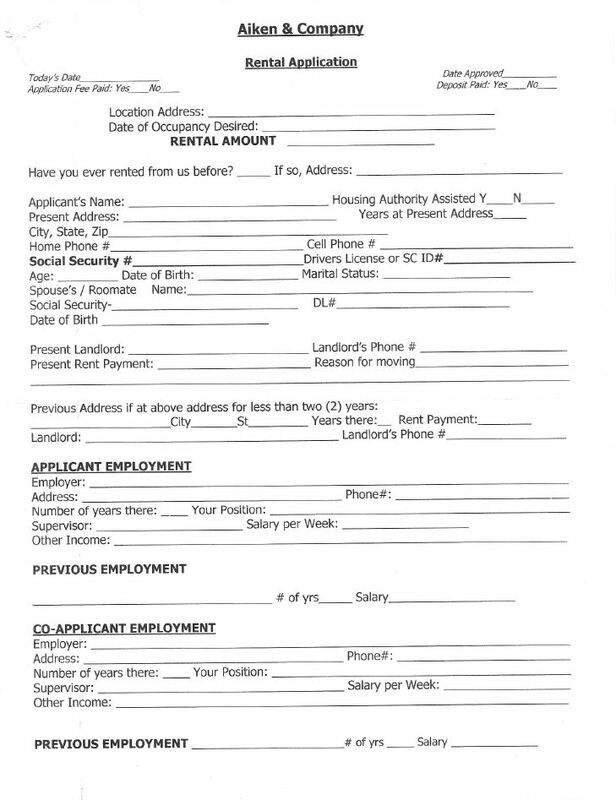 After you have physically viewed the property, you can submit the application accordingly. There will be a fee of $35 for the applicant along with any other person living in the rental property that is over the age of 18 years old. 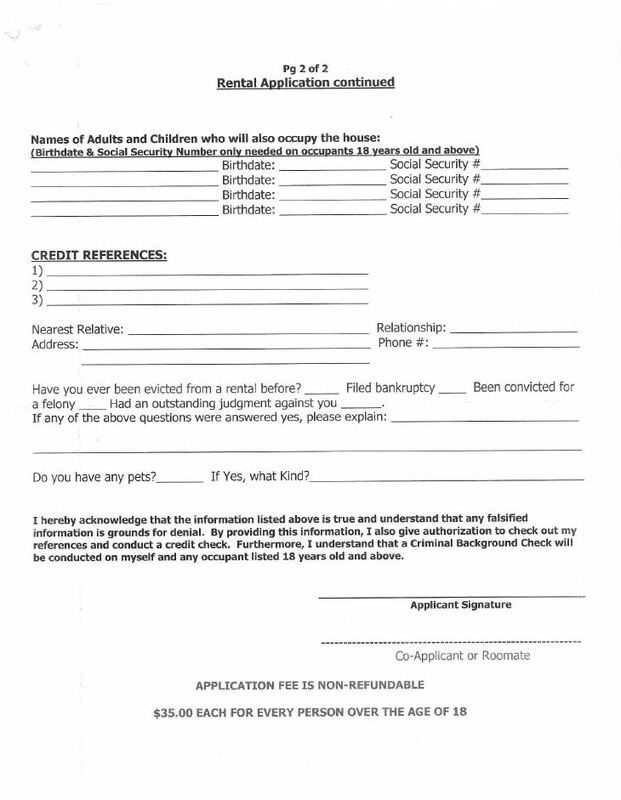 At any time during the term of the lease agreement, should you have additional occupants that will be living with you in the rental property, and they are not listed on the lease, but over the age of 18 years old, an additional $35 fee must be paid for each individual to cover the necessary expense to run both their respective criminal background and credit check report(s). Application fees are non-refundable, and you will need to provide proof of income showing that you bring home at least 3.0 times the amount of the monthly rental. It normally takes 2-3 days to fully process an application. If you are moving from another area and are unable to physically view the property beforehand, you can still proceed with the application process. Upon approval of the application and remittance of the security deposit, you may be required to sign a statement that you are renting the property sight unseen and refusing to accept the property once you arrive could result in a forfeiture of your security deposit.